It seems fitting that the first record posted on this site (the introductory one notwithstanding) is the one that inspired the name: Old Time Blues, played by Mamie Smith’s Jazz Hounds; an early black jazz record, and a pretty fine one at that. This disc, recorded February 21, 1921 in New York City for Okeh records, interestingly does not feature Mamie Smith herself, instead her backing group, the Jazz Hounds, play a pair of instrumental tunes. Rust lists the personnel as being Johnny Dunn on cornet, Buster Bailey on clarinet, Leroy Parker on violin, Phil Worde on piano, and Chink Johnson on tuba. Brian Rust explicitly notes “not Mort Perry” on xylophone, yet Perry Bradford himself states in his autobiography, “on this date, we used Mort Perry on the xylophone.” Alternatively, perhaps it could be the famous Green Brothers, Joe and George Hamilton, as suggested in the comments by Uncle Dave Lewis. The first side is a composition by trumpeter Johnny Dunn, who also plays in the recording along with Buster Bailey on clarinet. Perhaps one could consider this the theme song of this site. 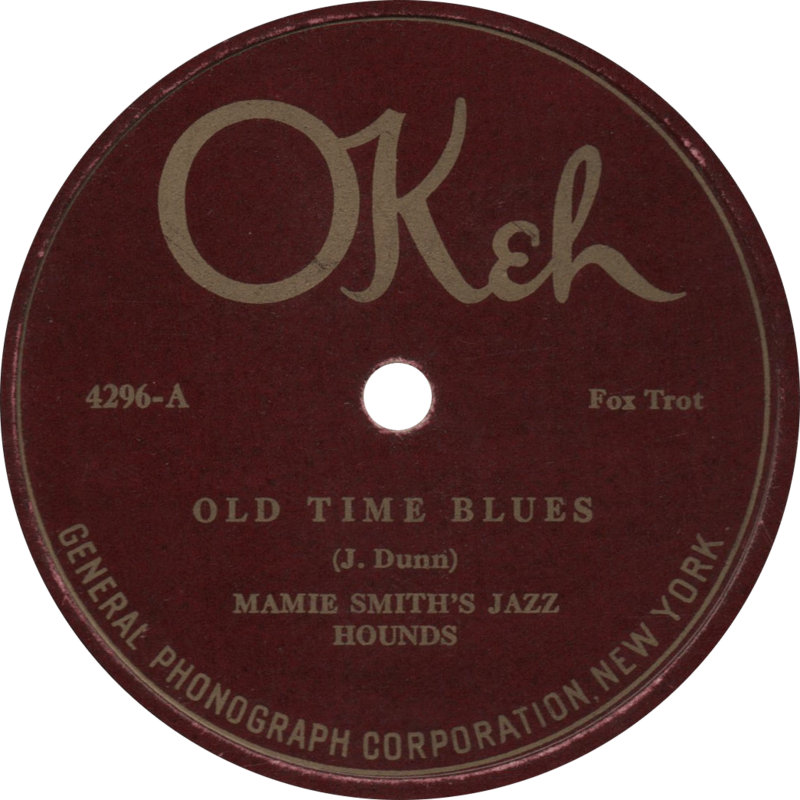 Old Time Blues, recorded February 21, 1921 by Mamie Smith’s Jazz Hounds. 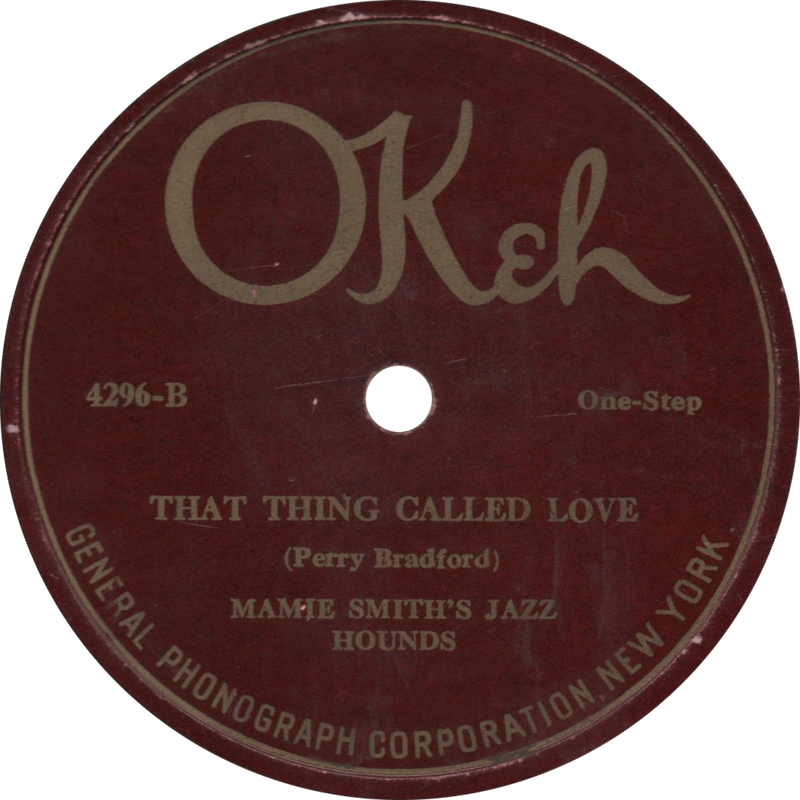 The flip-side of that record is an instrumental version of Mamie Smith’s first recording, “That Thing Called Love”, composed by Perry Bradford, which heavily features the unidentified xylophonist. That Thing Called Love, recorded February 21, 1921 by Mamie Smith’s Jazz Hounds. Updated on June 24 and November 24, 2016, with with improved audio on June 26, 2018. This entry was posted in Records and tagged 1920s, 1921, Blues, Buster Bailey, Chink Johnson, Green Brothers, Harlem, Jazz, Johnny Dunn, Leroy Parker, Mamie Smith, New York, Okeh, Perry Bradford, Phil Worde by R. Connor Montgomery. Bookmark the permalink. This sounds like two xylophones, and I’m pretty sure that it’s the Green Brothers; Joe and George Hamilton Green. This is mx. S7790; the Mamie Smith Jazz Hounds sides continue up through S7795 and S7796 is by the Green Brothers. That would indeed stand to reason, given the matrices. It certainly is an intriguing prospect, as it would make it one of the earliest racially integrated recording sessions, over two years prior to the New Orleans Rhythm Kings session with Jelly Roll Morton that is sometimes credited as the first integrated jazz music session. First impression as a newcomer to Old Time Blues: the meticulous organization of this website-forum makes it a pleasure to see and easy to use. I’m sure that’s a direct reflection on the personality & values of our founder, R. Connor Montgomery. Thanks, Connor. Second, knowledgeable contributions by people like Uncle Dave Lewis make this forum a rich process. Hence the question: I’ve understood Mamie Smith’s August 10, 1920 recording of “Crazy Blues” is regarded as the first Blues ever recorded…but I’ve also heard Bert Williams recorded a vaudeville-style Blues shortly before Mamie’s recording…and as the research continues perhaps there are even earlier contenders for “first”? Blues is basically folk music. Oral tradition. Nailing down the “first” of this or that regarding a folk art is intriguing & fun, partly because we accept it’s ultimately impossible. Unless we’re doing or studying the Field Research, we rely on recorded or written examples of the folk music to understand it. When I stay conscious of the folklore process, that helps me to organize what I learn about Blues; so to my mind what we’re discussing here is the earliest known example of pure folk music transitioning into the pop-culture process, that is folk music that’s recorded, written, or even broadcast…and that’s a big jump. For example, W.C. Handy’s first notated Blues…we can feel the big difference between that and the feeling of Mamie Smith’s “Classic Blues”, and then we feel the huge difference between those examples and folk Blues first recorded in what, 1923 or so? That “Crazy Blues” is identified as “the first Blues record” is a common misunderstanding, and old literature identifies it as such, it’s still a very important record, but has a longer and more complicated imprimatur — it is the “first blues record by an African-American singer to reach a wide audience.” It sold 40,000 copies in a matter of a couple of months, which captured the record industry’s attention and established that African-Americans were a powerful segment among consumers of phonograph records. Thus the “race records” phenomenon was born; it didn’t exist before “Crazy Blues” though records of blues, and of African-American singers, had already been made. There were many records called “blues” issued in the 1917-19 period, and the oldest record of a blues I can find is “The Memphis Blues” as recorded by the Victor Military Band on July 15, 1914. The earliest known recordings by a female African-American singer were of May Hyer, who recorded for the Kansas City Talking Machine Co. in 1897. But none of those records have ever been found. The earliest male “Downhome Blues” record by a male, African-American singer appears be “Barrel House Blues”/”Time Ain’t Gonna Make Me Stay” by Ed Andrews, recorded by Okeh in Atlanta in March 1924. Regarding the “Crazy Blues”, Mr. Lewis touched on all the pertinent points and summed it up more concisely than I believe I could have, so I’m afraid there’s not much more I can add there.